In Fall of 2016, All Saints planting team (Kevin & Melissa Craik, Ben & Lei Edstrom, Galen & Joanie Yorba-Gray & DJ Jackson) began meeting and planning for a new Anglican church in Everett, WA. Bethel Baptist Church & Pastor Wes Johnson graciously offered to share their facilities with us. 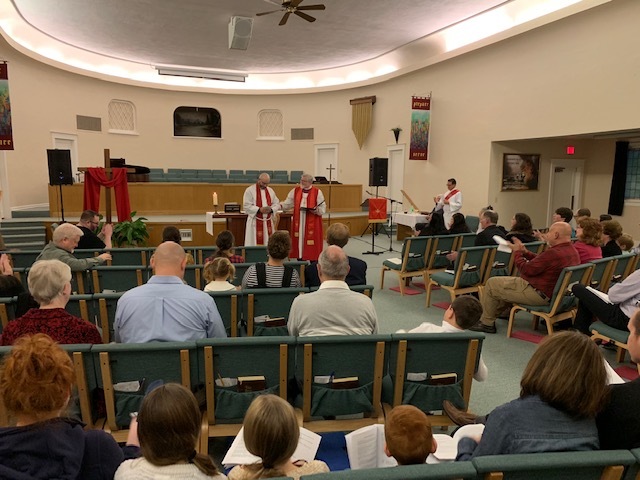 As a result, All Saints Church hosted our first public service on Ash Wednesday, 2017 and began weekly Saturday night worship services that Easter. Congregants from a variety of denominational backgrounds and experiences gather together united by our common love for God and desire to worship liturgically with Scripture, prayer, song and celebration of the Eucharist. Over these past months, breaking bread both in our services as well as through our church weekly after-service meals, we have grown closer in our relationship with our Lord and with one another. In October 2018, Father Kevin & Melissa accepted a call to plant a church in their hometown state, CA, and Bishop Kevin Allen of our diocese, installed Father Ben as our new rector. We continue to worship with joy and obedience as we anticipate God’s fulfillment of his promise to us: “being confident of this, that he who began a good work in you will carry it on to completion until the day of Christ Jesus.” Philippians 1:6. All Saints is centered on experiencing God's transforming presence through Baptism, Holy Communion, and every way he uses creation to draw us near himself. Click here to learn more. God reveals his truth and his will for us today in the ancient words of the Bible. Reading, teaching, or discussing the Bible form a large part of every All Saints service. We encounter the grace of God as we live out our faith in the life of the church--through common prayer and authentic friendships. Spirituality takes time, patience, and space. We value sustainable rhythms of prayer and service over programs and busyness. We wholeheartedly embrace the historic Christian faith summarized in the Apostles’ and Nicene Creeds. We acknowledge the Bible as God’s inspired word and submit to it as our final authority. We believe that the Holy Spirit has been present in the church, guarding and guiding it through the centuries, so we strive to emphasize those things that have been believed in common by all Christians from the beginning. Our worship services include a thoughtful blend of contemporary and traditional music, a Bible-based sermon, and the celebration of Holy Communion. Our pre-written form of worship (which we call liturgy) gives us rich words to shape our prayers, and provides space for our own prayers as well. A printed program is provided at the beginning of each service, so everyone can easily participate. While we take the things of God seriously, we don’t take ourselves too seriously, so we strive to worship in a way that is meaningful and reverent, but never stuffy. Our tradition is called "Anglican," a word that means "of England." From the earliest centuries of the church, Christians in the British Isles developed unique and beautiful patterns of community prayer centered in the Bible and Holy Communion. These forms of worship were eventually collected in the Book of Common Prayer, the standard which continues to guide our worship today. This faith tradition has grown into a worldwide fellowship called The Anglican Communion--the third largest expression of Christianity. Our particular denomination is called the Anglican Church in North America.